About the creator: Tom Ewer is a professional blogger and founder of Leaving Work Behind, a blog that helps people quit their jobs and build profitable online businesses. Price: The course include two tiers and comes with a six-month money-back guarantee. $49: This is the full package, including the Paid to Blog course and Successful Blogging guide as well as exclusive interviews and bonus articles. $29: This option includes the two guides, Paid to Blog and Successful Blogging. Who It’s For: Paid to Blog is for anyone interested in building an online business through blogging. While it’s mainly focused on beginners, the Successful Blogging section is also helpful for experienced bloggers. However, if you´ve been freelance blogging for a while, you might find the course is overall too focused on the beginner level for you. What It Will Help You Do: The course will teach you how to write for the web. You’ll learn how to structure a post, how to write compelling articles, how to optimize your writing for SEO and for a specific audience, and how to combat writer’s block and find new ideas for blogging. You’ll also learn how find potential clients, how to pitch your services, and what to do once they’re interested. What’s Included: Two sections of the course, Paid to Blog and Successful Blogging, which touch on different aspects of the freelance blogging business. Part 1: Paid to Blog: This section focuses on the “hard” skills and tools you need to succeed as a freelance blogger. Learn how to create your blog from scratch, find clients, pitch your writing, negotiate rates, create a contract, track your time and bill your clients. This section also helps you learn how to use social media to promote your blog and how to build your writing business. Part 2: Successful Blogging: In this guide, Tom focuses on the “soft” skills, since landing gigs is only half the battle. As a freelance blogger, you also need to be able to write compelling posts, understand your audience, format and structure your blog posts well, and use SEO to your advantage. Bonuses: If you choose the full package (which I did and heartily recommend), you also get exclusive interviews with writers like Carol Tice from Make a Living Writing, Sophie Lizard from Be a Freelance Blogger, and Ali Luke from Aliventures. The Best Part: The best part of Tom´s course is that after finishing it, you are ready to get to work. There’s no excuse not to start, since actionable steps are laid out in every lesson. Along with explaining the concepts, Tom also gives you homework and examples of how he accomplished each task. He’s also available to answer questions, so you can email him anytime if you’re not sure how to do something. You can come back to the course at any time to review key concepts. What Would Make It Even Better: I can’t think of anything that could be improved. The course addresses every part of the freelance blogging business, and its tips are well explained. How It Changed My Life: I started blogging two years ago, not necessarily knowing what I was doing. For a year and a half, I wrote about things I was interested in. I was lucky enough to land a few freelance writing jobs, but I still wasn’t sure where I was headed. Finding Tom’s blog and course was key to my writing career. While going through the course, I learned all the things I was doing wrong and how to improve them. Paid to Blog gave me the confidence to launch my freelance blogging business. I just relaunched my blog on WordPress, and I learned how to write better blog posts for my audience. I’m also more confident in pitching clients and just landed my first paid blogging client. Our Recommendation: If you’re new to the world of freelance blogging, this course will help you start your business. Its actionable steps will help you improve as a blogger and find paying clients. 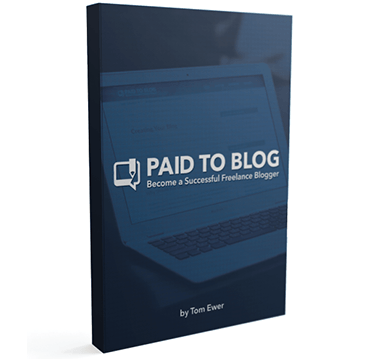 Have you taken Paid to Blog? What did you think of the course? Corina Manea is a PR professional, social media strategist and freelance writer, currently living in Madrid, Spain. Founder of NutsPR, she writes about her passions: public relations and social media. I second what Corina says! I was lucky enough to find LWB and Tom’s P2B course as my foray into freelance writing and it’s made ALL the difference. Packed with value!